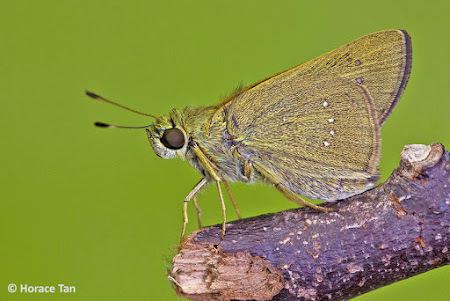 The identification of some Lycaenidae and Hesperiidae from field shots is often challenging due to the very similar physical features of several species. This is made even more difficult due to the wide variation of these features amongst individuals and between different sexes. In museum and scientific collections, it is much easier to identify and differentiate between species as comparisons amongst a number of specimens can be done systematically. Where available, male specimens can be dissected and their genitalia compared with a database of figures from reference resources. In recent times, the use of DNA sequencing can help advance the identification of specimens with greater accuracy. However, positive identification of field photographed individuals is often a tricky business, because either the upperside or underside of an individual may not be available. Furthermore, if the butterfly photographed is a worn or tattered individual, its identification may prove almost impossible. 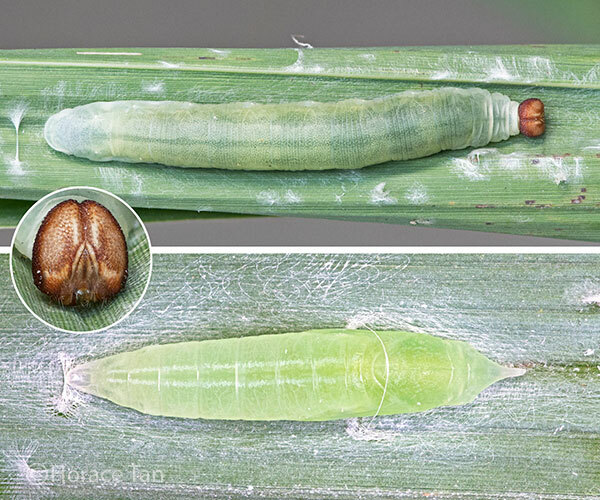 This is where the early stages of a butterfly can add another dimension to the accurate indentification of the species concerned. 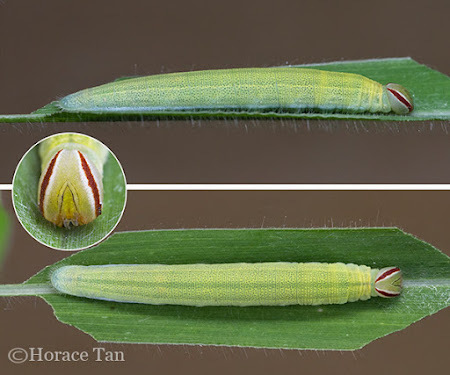 Over the years, our early stages expert, Horace Tan, has had many opportunities to breed and document the egg, caterpillar and pupa stages of a butterfly, and the adult morphology compared with reference literature. After much scrutiny and discussion with our Malaysian expert Dr TL Seow, we have narrowed down the identification of two more species of Hesperiidae. 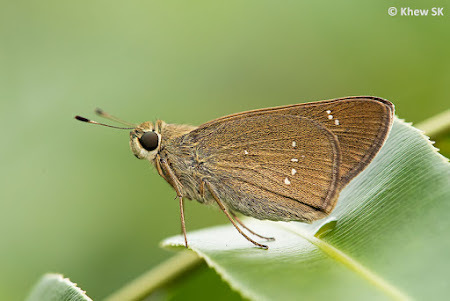 The first is a species from the genus Caltoris. These "Swifts" are largely found in heavily-shaded forests in Singapore, and thus far, the Full Stop Swift (Caltoris cormasa), is the only species that has been identified with certainty. A recent find, is another species, Caltoris malaya (Malayan Swift). The Malayan Swift is described as being dark brown with the usual spotting on the forewing. 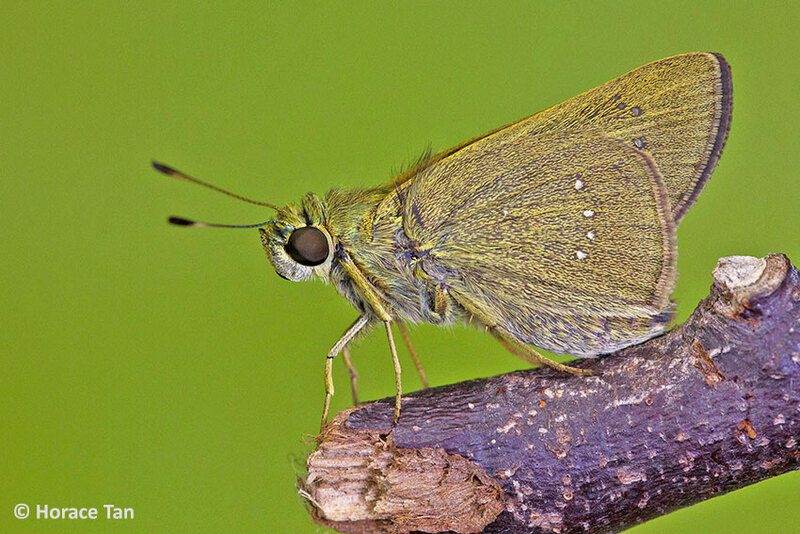 A key distinguishing factor is the absence of the cell spots on the forewing. 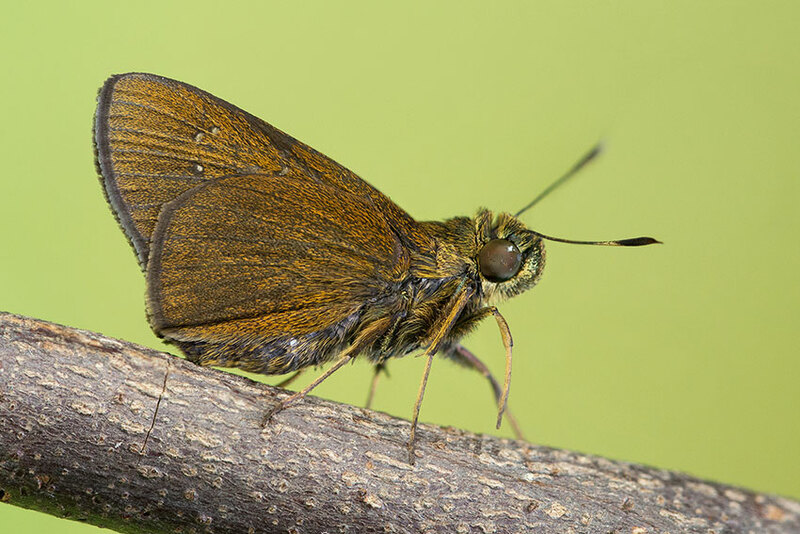 On the underside, the male is ferruginuous (or dark rusty) brown, whilst the female is ochreous (or reddish-orange) brown. Several individuals were bred, and the specimens were examined and compared. 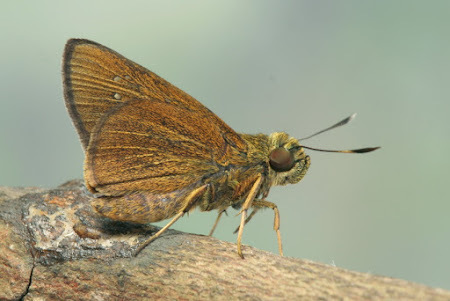 The consistent absence of the forewing cell spots narrowed down the idenfication of the species to Caltoris malaya a species that is documented as extant in Singapore by the early authors. We record this re-discovery of the Malayan Swift (Caltoris malaya) as species #323 in the Singapore Checklist. The next species, also a re-discovery, is the Bengal Swift (Pelopidas agna agna). This species is very similar to the more common extant species found in Singapore, the Small Branded Swift (Pelopidas mathias mathias). Differentiation between the two via field shots can be a hit-and-miss affair. However, Dr TL Seow has added his other observations to help narrow down the identification between these two species. Male: FW line through cell spots cut brand variably at lower third. FW spots large especially 2 and 3. Spot 2 irregularly rectangular. Female: Line through cell spots generally pass close spot 1b but variable and unreliable. HW ground colour uneven, marginal areas often paler with dark shading/smudges around the spots. Male: Line through cell spots only touches lower end of brand. Forewing spots often very small and spot 2 very narrow. Female : Line through cell spots usually far from spot 1b but unreliable. Underside ground colour is even and without obvious dark shading/smudges around the spots. Underside is ochreous without a grey tinge. Breeding of several individuals and comparison with the adult males and females strongly suggest the presence of the Bengal Swift (Pelopidas agna agna) in Singapore. However, another related species, Pelopidas lyelli which also bear a strong resemblance to the Bengal Swift, may also create some confusion. 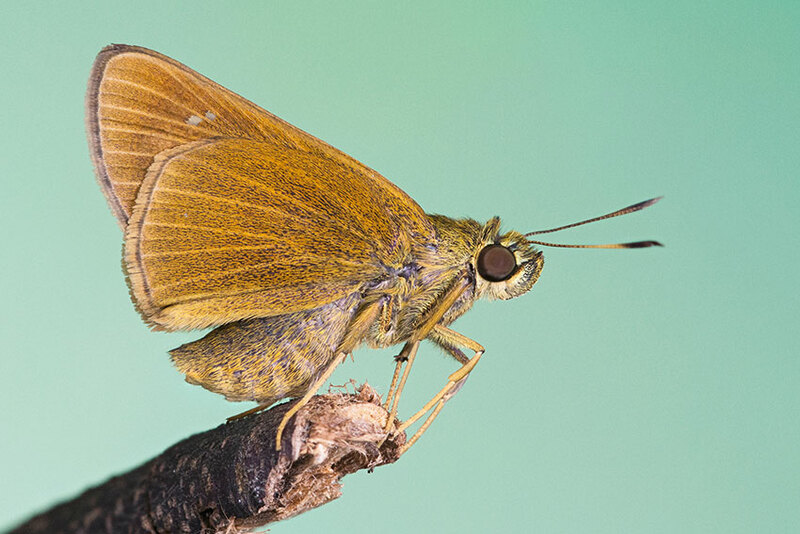 This Australian species should be looked for in Singapore where it is not impossible that it reached the shores of Singapore like the Yellow Palm Dart. Given the comparisons and specimens from breeding documentation, we record the Bengal Swift (Pelopidas agna agna) as species #324 as a re-discovery for Singapore. 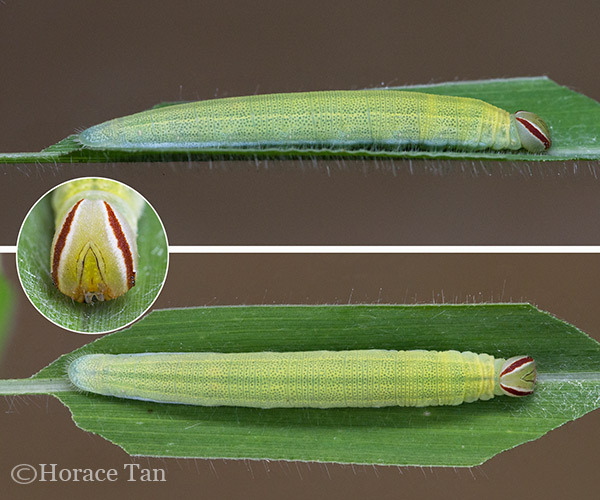 Further observations will continue as to whether there are other Pelopidas species exist in Singapore. It is likely that we will continue to discover other Hesperiidae from the lookalikes via their early stages as and when the opportunities arise. Henceforth from 2015, all bred and collected material will be submitted to the Lee Kong Chian Natural History Museum for DNA sampling and the voucher specimens documented for future comparisons when more material are available. 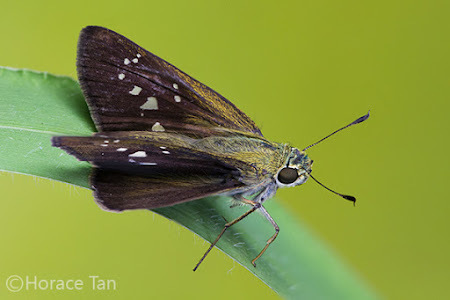 Special thanks to Horace Tan for his patience and effort in documenting the early stages of these Skipper species and to Dr TL Seow for his persistence in scrutinising the voucher specimens and coming out with additional consistent ID features for the species concerned . The Butterflies of The Plain Peninsula, A.S. Corbet and H.M. Pendlebury, 4th Edition, Malaysian Nature Society.